My 2nd set with Brickarms with my own Type 99 Design. A Mod with the M21 to make a WW2 Sniper. A Browning 50. Cal i have the Biopod to put on it im just to lazy tto get it. The Lurger credit to Will Chapman for the design. Now finally my Type 99 This is My design so please do NOT USE IT. If you want to use it E-mail me i might change my mind. dool mods, but you needbetter lighting man. and the smg u made is a type100 not a type99. Nice work and I know how you did the type 99 (or at least think I know how). Should I tell the world? Where you put like Mocpages.com go to the instructions page and the place where it says the website`s name right click it then go down the list and click copy then in your next comment on here right click it again and put paste. Hmm can i have a link to the instructions? Hmm i dont really know any. Hmmm i would say no but you can get it that Batman set with his car and Mr Freeze`s Car. 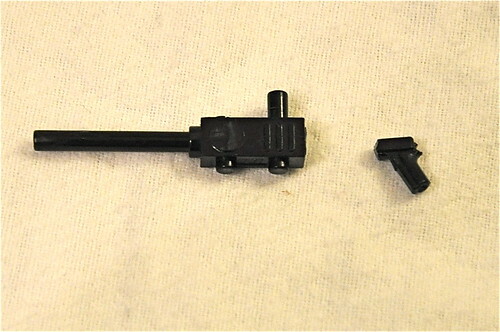 I really cant find a picture of the part i used but if you pause this video http://www.youtube.com/watch?v=EqLARVSY4jQ at 2:24 the gun that the guy is holding is the part i used but i cut the two sticks at the end. Quoting Brian Darkwood hey aaron i am a big fan hey i was wondering about how you made the browning it is so cool please tell me. if you can comment on my page please do. This picture will help alot http://farm4.static.flickr.com/3496/3205979722_b1587f213c.jpg but i cut the stick on the top of the gun and used the MP40 Clip from Brickarms. hey aaron i am a big fan hey i was wondering about how you made the browning it is so cool please tell me. if you can comment on my page please do.